Families that rely on traditional fuels for lighting, such as firewood, send several hours each day collecting fuels. This burden falls disproportionately to women and children, and robs them of an education and income-generating work. Indoor air pollution, the result of using kerosene for lighting, leads to millions of deaths each year, damages eyesight and limits opportunities. My journey towards SolarBuddy started in 2011 when I read an article in Time Magazine. The article talked about how lack of access to safe and reliable lighting in refugee camps adversely impacted the health, safety and educational opportunities of children and their families. I’d always had a knack for making things so I started to play around with some ideas that could ‘solve’ the problem. I thought about how lights are built into the walls of our modern homes and eventually came up with a design that imbedded solar technology into the structural element of the tent - using the tent pole. I designed a prototype and flew directly to UN Headquarters in Geneva. I didn’t have a meeting set up, so I sat in the lobby all day until I eventually managed to get an audience with the team tasked with solving the energy poverty problem. Luck brought all the right people together that day and I ended up spending the next few years working with the UN rolling out the design across numerous refugee camps. I launched SolarBuddy to help raise awareness of the 1 in 5 people worldwide who do not have access to electricity. It’s designed as an education and empowerment program with a practical hands-on component, in which participants get to learn about the issues and also become part of the solution by assembling a solar light. During the program participants also get to write a letter to a child who will receive it together with the gifted light. I think this is one of the most impactful parts of the program for the both the letter writer and the recipient. Keep in mind that without access to electricity children living in energy poverty can’t receive text messages or emails and these letters are literally the most ‘modern’ form of communication they’ll likely ever receive. I’m extremely proud of our partnership with Symantec and the impact we’ve been able to have. Over the past year we’ve come together at various volunteer events held at Symantec offices across the globe. At these events employees have been able to learn about the issues and assemble thousands of our solar lights. 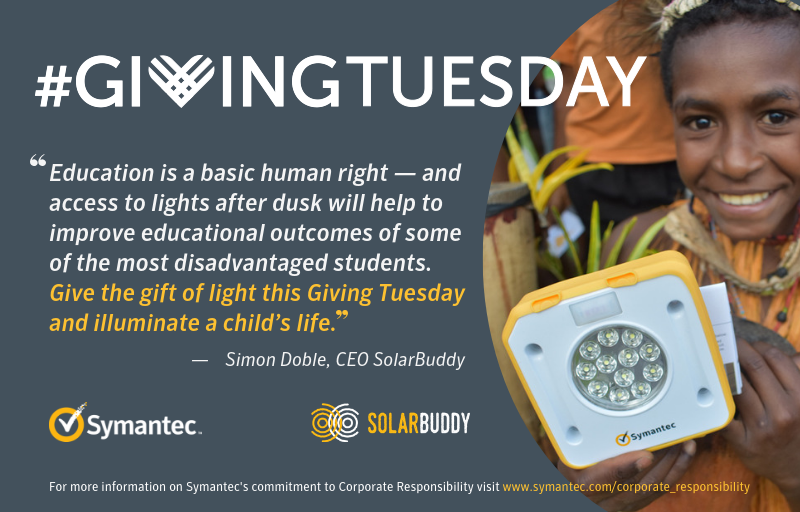 The lights donated by Symantec employees have helped numerous children and their families living in remote off-grid communities in Papua New Guinea (PNG). Only 10 percent of PNG residents are connected to the electricity grid, leaving 7 million people reliant on dangerous kerosene, campfires, and expensive battery operated torches. The donated lights have helped kids complete their homework after dark and enabled their parents to continue working on their small businesses. They’ve also contributed to keeping girls and women safe as they visit the communal latrine and navigate their way around the village after dark. Our joint partnership has helped students like Awinya Fortunate, pictured below, from central Ghana who does not have electricity at her house or school. She found it difficult to keep studying after dusk and the fumes from her kerosene lantern made her cough and strained and stung her eyes. The gift of a SolarBuddy light has helped her to study more efficiently and for longer, in a healthy, smoke-free environment. She hopes that with good grades she’ll be able to become a teacher someday. You can learn more about Fortunate by watching this video. SolarBuddy has seen tremendous growth in the last two years engaging with over 50 major corporations and 450 schools and donating more than 64,000 solar lights to children all over the world. Our recent impact assessment showed a 78 percent increase in time spent on homework and an 80 percent reduction in average weekly kerosene expenditure in communities with SolarBuddy lights! We want to keep fighting the good fight and gift solar lights to 6 million children by 2030, which is the UN’s deadline for achieving the Sustainable Development Goals.